All our cottages have access to our own private beach on spectacular Lake Michigan. 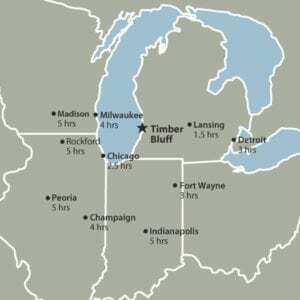 Timber Bluff is easy to get to from anywhere in the midwest. Minutes from Saugatuck-Douglas, Timber Bluff is the perfect getaway for couples or families. Interstate 94 East into Michigan to Exit 34, 196 North. Turn left, go over Interstate. You will almost immediately dead end at Lakeshore Drive. 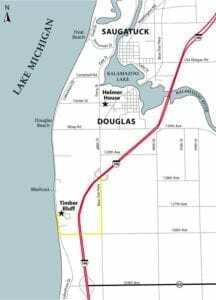 Turn right, continue 1-1/2 miles to 2727 Lakeshore Drive, Timber Bluff. Park by your cottage as indicated on the Timber Bluff Map. Interstate 96 West to Interstate 196 South/West at Grand Rapids. 196 South/West to Exit 34, Fennville. Turn right, you will almost immediately dead-end at Lakeshore Drive.